What if your elementary school education involved field trips on a Greenpeace ship? At the Damanhur School, eco-education isn’t just about understanding concepts of ecology and growing sprouts. It’s important for our children to have first hand experiences of what it means to be passionate about protecting the environment and creating low-impact alternatives. 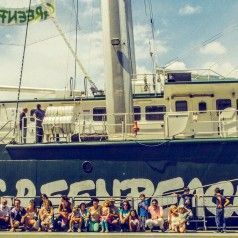 Last week, Damanhur students together with their caretakers visited the Rainbow Warrior III, a Greenpeace ship that was docked in Genoa, Italy. Giuseppe Onufrio the Director of Greenpeace Italy extended an invitation for a group from Damanhur to join their crew, seeing as how there is frequent contact and exchange between Greenpeace and Damanhur. The group was welcomed aboard by Captain Joel Stewart. The Damanhurians brought wine, olive oil and honey made in Damanhur as a thank you gift to the crew for the hospitality and visit. The Greenpeace guides shared about their recent activities, and at the end of the day, they hoisted the Damanhur flag on the mast of the ship! What a great honor. The Rainbow Warrior III has an innovative rigging system capable of supporting 1,260 square meters of sails! It’s a very technologically advanced system with low environmental impact. The ship is currently sailing the Mediterranean Sea on the “Non fossiliziamoci” (Let’s not fossilize ourselves) campaign to raise awareness about the damage the damage caused by coal power plants. Do you have a dream for new approaches to education and schooling with ecological awareness? Share with us in the comments!